In our weekly group we have some interesting projects. 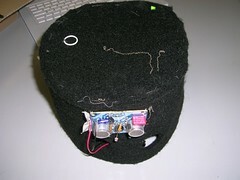 One might be the “Superhero costume” that allows the wearer to sense thing that are close through a super sonic sensor. The gloves prove quite successful so far. All kids were fascinated by the glow-in-the-dark color and one boy is working on an idea very similar to Deirdre‘s and Eimear’s glove. I will give you more information about the project next week. To test hard- and software and develop together with children we have a weekly group of children coming to our lab. One group was recently finishing the projects: clothes for agents inspired by James Bond. They did build bracelets and had a dance as a presentation in Bremen’s town hall. Lessons we learned: the connection between hardware and yarn is a critical point and we hope we can solve with the textile connectors. The children liked the software but found a lot of small bugs..